You have a small team with no big post players. So you decide to run the 5-out, or open post offense. The open post offense works well against man-to-man defense, but you also need a 5-out zone offense to attack the 2-3 zone defense. 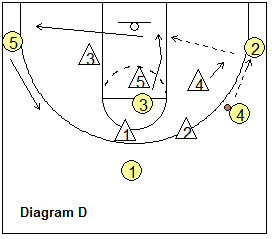 You could use Coach Sar's open post "double-up" offense against either man-to-man or zone defenses. Or, take a look at the 5-out zone offense below, which creates movement, has continuity, and is very simple and easy to learn. Of course, our five quick, small players are always going to try to speed the game up, full-court press, get the fast-break going and score in transition, before the zone defense is set. See the diagrams below. Notice that we are in a 5-out set vs the 2-3 zone. 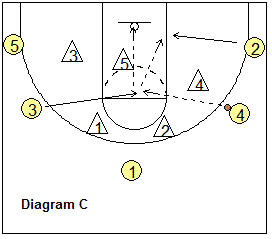 O1 passes to either wing. We like to reverse the ball once or twice. A skip pass to the opposite wing (O4 in diagram B) sets things up very nicely as the zone is over-shifted and the bottom outside defender often will come out initially to defend the wing who receives the skip pass. 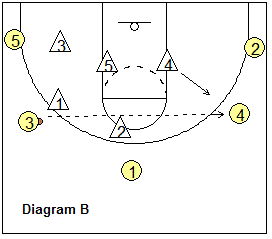 Whenever the ball goes to a wing, we flash the opposite wing (O5) into the high post (free-throw line area). It's amazing how often this pass is wide open for a quick shot. I think sometimes the low defenders get lulled to sleep because we don't have any post players inside for them to defend. And, there is no high post player initially to defend, so they may forget about denying the high post pass. Whatever the case, this pass and shot is often open. If the middle low defender (X5) comes up to defend the shot, we may have a bounce pass to the ball-side corner (O2) cutting to the hoop (diagram C) especially if we have caught the outside low defender (X4) defending our wing or slow in rotating back inside. Notice that the opposite corner (O3) rotates up to the vacated wing spot. 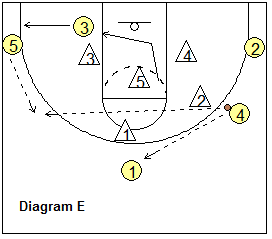 Now, if the pass to the high post is denied, the wing (O4) could pass to the corner (O2 in diagram D). When the ball goes to the corner, the high post cutter (O5) then cuts to the ball-side block for a possible pass from the corner. If the pass is not there, O5 rotates out to the opposite corner, while O3 rotates up the wing. Now, if the ball goes back to the wing (O4 in diagram E), O4 could reverse the ball back to O1, and then O1 passes to the opposite wing (O3)... or O4 could skip pass directly to O3. Now we have all the same options available, just on the opposite side. O4 will flash to the high post. Ball in the high post. 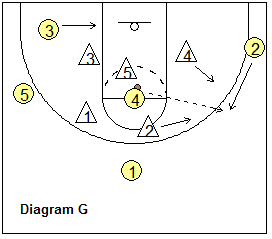 The pass from the high post to the opposite wing (diagram G) is usually a good, safe option. 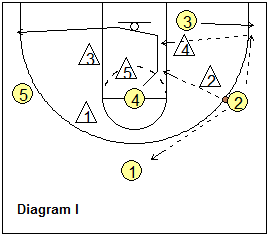 This could result in an open 3-point shot from the wing (O2), or a pass from O2 to O3 cutting underneath (diagram H). If neither the shot nor the pass to O3 is there, O3 moves out to the ball-side corner. O4 cuts through (diagram I) and could get the pass from O2. Otherwise, O2 passes back out on top to O1. O4 rotates back out to the opposite corner and we are back in our 5-out set. O1 will mostly anchor and run the offense from the top, but can exchange with a wing. 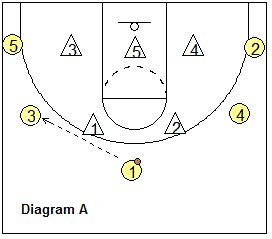 Ball on the wing, opposite wing flashes to the high post. 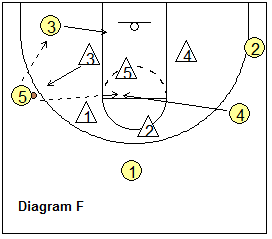 Ball in the high post, ball-side corner cuts inside, opposite corner fills vacated wing spot. 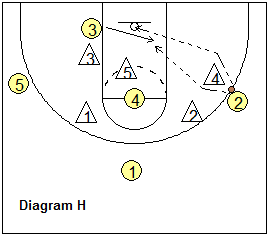 Ball in the corner, high post cutter cuts through to the hoop and then rotates out to opposite corner. Four offensive rebounders with O1 on top as our safety.